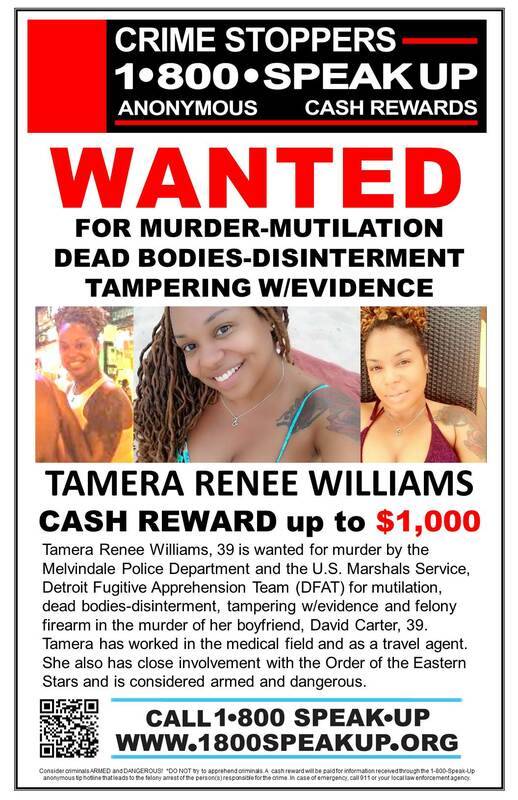 Tamera Renee Williams May Be In Atlanta Is wanted for the brutal murder of her boyfriend in Michigan. A woman known to be a world traveler and former travel agent fled the state of Michigan last year after brutally mutilating and murdering her boyfriend in Melvindale, according to authorities. Tamera Renee Williams, 39, is accused in the Sept. 29, 2018, slaying of her boyfriend, David Carter, 39. Police said a felony warrant against Williams was issued for first-degree homicide, disinterring a dead body, mutilation and tampering with evidence. She fled the state in mid-October last year and hasn’t been seen or heard from since, according to officials. Williams is 5 feet, 5 inches tall and weighs about 190 pounds, officials said. She has brown eyes and brown hair, but might have changed her hair style and color since the incident, police said. She is a known world traveler and had previously worked as a travel agent, according to authorities. Police said Williams should be considered armed and dangerous. Carter was a father who volunteered with the Melvindale Junior Football League. He was the entrepreneur behind Lavish Habits Clothing and worked full time at the Magna Seating Plant in Highland Park, officials said. Crime Stoppers of Michigan is offering a cash reward of up to $1,000 for information that leads to the location and arrest of Williams. If the tip is received by midnight Wednesday, the reward will be doubled. Anyone with information is asked to call Crime Stoppers at 1-800-SPEAK-UP or go to www.1800speakup.org. Callers can remain anonymous.